Ever tasted a Durger at Trusty Truck? A week ago Friday, we were surprised at just how many food trucks were in the 47th St & Park Ave area. There were 9 food trucks in a 1.5 block area that day. A big scene like that can often mean trouble, so we stopped by 47th & Park on Friday to see if things were still hopping. While there were only 5 food trucks this time, there was a new vendor called the Trusty Truck with a big crowd around it. We asked someone where the end of the line was, and were told they had sold out. What, it was only 1:10! Oh well. We took photos of the truck and the menu, and walked down the block to another vendor to buy lunch. After buying lunch from another food truck, we walked back to the Trusty Truck to see what was happening. Everybody had cleared out, and the owner, Dominick, and chef, Giovanni, were outside the truck, so I walked up and introduced myself. Dom and Gio said they read NYSF all the time, and were excited that I stopped by. They asked if I had a few minutes so they could make me some food. Even though they had sold out, I guess there were still a couple of things in the truck. Hell yeah, that’s what we live for! Giovanni jumped into the truck to cook, and Dominick started telling me their story. They are a couple of local guys (Westchester & NJ) who met and became friends at Manhattan College. Gio has been cooking since he was 15, and after school, he went to Madrid and worked as a chef. Dom wanted to open a restaurant, but the costs were prohibitive, so he decided to open a food truck instead. Dom got in touch with his friend Gio, and here they are. The Trusty Truck opened two weeks ago. The signature dish of the Trusty Truck is a durger, which is a burger shaped like a hot dog. We’ll get more into that later, but the first dish Gio brought out was Mac N’ Cheese Bites, which cost $4. The bites were made with macaroni sauteed in garlic, bacon and 3 cheeses: Vermont cheddar, American and Velveeta. That last one surprised me and I asked Gio about it. He said it was needed to get the right texture. The bites are rolled in panko crumbs with chives added, then fried. The menu said the bites are served with ranch dressing, but today it was a plum pepper cilantro dipping sauce. For an appetizer, these were 4 big balls! Our first taste was butter, then crispy breading, then creamy mac & cheese. Yum! The cheese taste was along the lines of a cheddar and American. On the plus side, we didn’t taste the Velveeta, but on the down side, we didn’t taste the bacon either. The macaroni could have been cooked a hair less, but that’s getting picky. The mac n’ cheese bites were still delicious. The dipping sauce was nice too. It looked liked a marinara, but was actually made with red peppers. One word of warning though, the dipping sauce is served cold. They want the hot mac & cheese bites to contrast with the cold pepper sauce, but it caught us by surprise. Next Gio brought out Sweet N’ Sour Meatballs, which also cost $4. As is de rigeur these days, Black Angus beef was used for the meatballs, and they use the same meat used for the durgers. When you hear sweet & sour, most people associate it with that gloppy orange sauce served at lower-end Chinese restaurants. This has nothing in common with those dishes. Gio told us the meat is cooked into a no-bean chili, then made into meatballs and fried a little more. The chili seasonings perk up the flavor of the meat a bit, but it’s still recognizable more as a beef meatball than chili. The real secret ingredient though is in the sauce . How do they get that wonderful sweet & sour flavor? The sour is easy, lemon juice, but the sweet is…concord grape jelly. Excellent choice. The bread was really soft and sopped up the sauce well. Our only complaint was a little fat floating on top of the sauce. It certainly wasn’t enough to negate the deliciousness of this dish, but Gio said it was a valid point, and he would look into using a leaner blend for the meatballs. For the durger, the blend works perfectly. Which brings us to the main dish, the Durger. There are several varieties ranging from $6-$7.50, with a veggie option too. 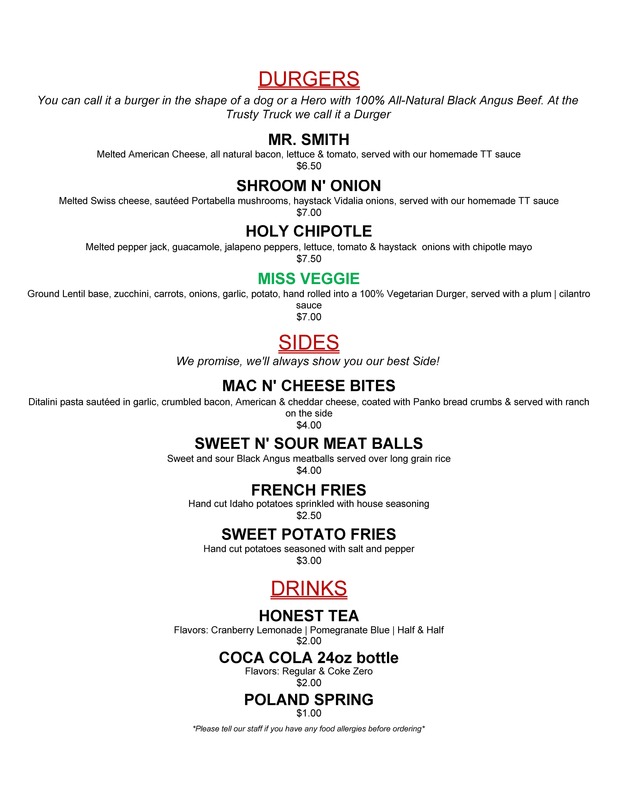 The most popular is the Mr. Smith, basically a bacon cheeseburger deluxe for $6. We got the 2nd most popular durger, Shroom N’ Onion, which costs $7. The chopped meat is made into the shape of a long hot dog, split horizontally and grilled. After being laid into the bun, it’s topped with Swiss cheese, sauteed Portobello mushrooms, haystack Vidalia onions, lettuce, tomato, and homemade TT sauce. This was a substantial sandwich to pick up and eat. The brioche bun is from Eli’s Bread, and it’s significantly larger than a hot dog bun. What a delicious sandwich! The taste of just about everything came through – with stretchy Swiss cheese, Portobello shrooms, haystack onions and TT sauce all going together well with the durger. Not to get too scientific, but lengthening a burger into hot dog shape and splitting it horizontally gives you more surface area to work with. This evens out the taste of the beef over the course of eating the dish, rather than getting huge bites of beef, as in a traditional burger. Our favorite part of this dish was the haystack onions. They were unbelievably light and crispy, almost evaporating on our mouth. The meaty, juicy shrooms were a close second. We couldn’t get the ingredients to the TT sauce. They said they could tell us, but then they would have to kill us. No thanks. The TT sauce was kind of like a chipotle mayo, but not spicy. We predict a long and successful run for the Trusty Truck, and look forward to trying even more of their menu. You can find the Trusty Truck on twitter here, and we have added them to our Mobile Munchies twitter feed. You can also find their website here and facebook here.